Gold on Tuesday atypically rose with a climbing U.S. dollar while silver and platinum fell. New York gold futures jumped 1.8% percent. Silver and platinum futures each declined 0.4 percent. February crude-oil surged $2.23, or 6.1 percent, to close to $38.74 a barrel. The average price for regular unleaded gasoline increased one-tenth of a cent to $1.843 a gallon, according to AAA. March silver lost 4 cents to close at $11.175 an ounce. April platinum declined $4.00 to $949.30 an ounce. 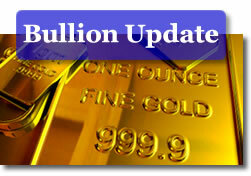 Gold for February gained $15.30 to settle at $855.20 an ounce. "More nervousness in gold as well as in other markets will surely be on tap for the next several sessions, and perhaps for months. While it was encouraging to record a day on which gold rose in tandem with its main rival (the dollar), the very long-term bear signal given in the wake of last October’s decline to $736 per ounce is (at least in the view of market technician Merv Burak) very much in place, so long as gold struggles under $925 per ounce," said senior analyst Jon Nadler at Kitco Bullion Dealers. Check out CoinNews market resources at Live Gold Spots, the Silver Coin Calculator, U.S. Mint Collector Bullion Coin Prices, and the Inflation Calculator.